Kyuu and Roku are inseperable, they prefer to stay together than go toward other people and they didn't give easily their trust. As a result, they seem asocial and cold towards other people. But when someone get to gain the confidence of them, they can be very sweet with him. They are curious, playful and they would not hesitate to annoy someboby they don't like. They are also jealous and possessive. 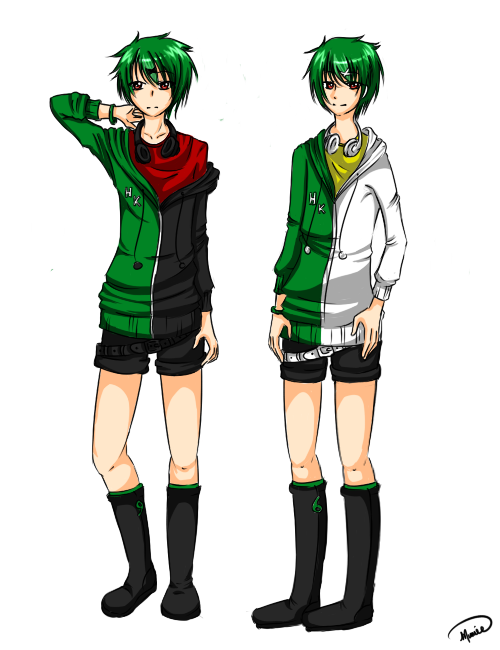 It's Kyuu, the older brother, who is the leader. He is more aggressive, impulsive, blinkered and easily offended than his twin. He take offence and complain easily, and his distrust can make him look unpleasant. While Kyuu can be asocial, Roku is just shy. He is more quiet and sweet, and he always follow his brother. He is also more fragile and naive. Dislike : That somebody hurt their brother or, on the contrary, that they hang round him, to be seperated, losing. Supplemental Information : They both have a keychain with a devil, a red for Kyuu, a yellow for Roku. They usually have a "9" and a "6" on their clothes. Gensine Kyuu & Roku are created by Hakuro Kaoru. Users shall not impersonate the creator of them and/or plagiarize the copyright. Genshine Kyuu & Roku © Hakuro Kaoru.